Okay, you’ll note a number of substitutions today, so I’ll run through those quickly. 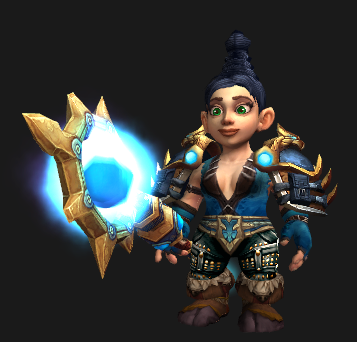 My preferred off-hand for this set is Primal Combatant’s Endgame, which, unfortunately, falls victim to Blizzard’s habitual tendency to make Alliance PVP gear blue and Horde gear red. That means Horde players interested in this set are stuck using something else. My suggestion is the Star-Heart Lamp; a fine alternative, but an admittedly different model. 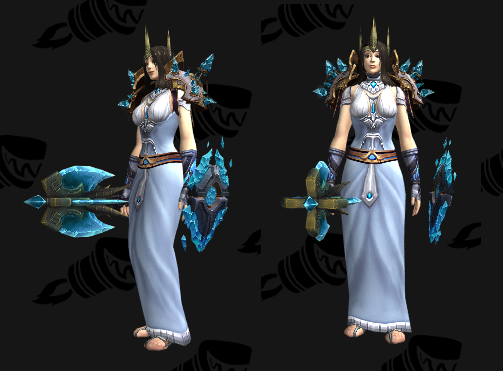 Relentless Gladiator’s Cord of Salvation, which I’ve provided as an alternative, is also a different model. But wait, Liz, Nethershard Girdle doesn’t have any user restrictions! So why is Relentless Gladiator’s Cord of Salvation even there? 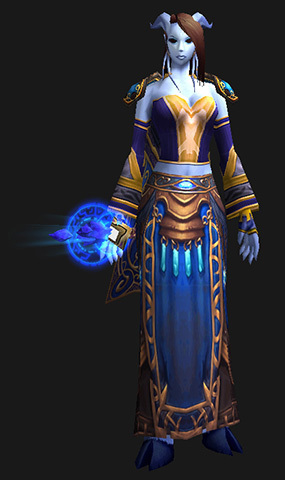 Because Nethershard Girdle doesn’t quite match the rest of the set and it was bugging the heck out of me, that’s why. My recommendation is to check out both belts on Wowhead and select the look that you prefer. Oh, and Happy New Year, everybody! If you haven’t run Molten Core yet, your time is running out. Get on it! It really brings out the green in her abnormally large Disney eyes. You know, the Horde get a lot of love on this blog, which is understandable because the Horde is awesome, but I was talking to a guy yesterday and he mentioned there’s this whole other faction out there. Apparently they like, uh, lion motifs and the colour blue and, uh, their king looks a bit like Bruce Campbell? I don’t know. They seem cool. So, to all you Alliance-heads out there. Uh, what do you call yourselves? Alliance-rs? Alliance-istas? Literally, only for you. That belt is faction-locked. The fungus really brings a certain je ne sais quoi. I don’t normally work with faction-specific items, but the moment I saw Jessera’s Fungus Lined Tunic I was in love. The short version is that they drop off a mob that can spawn during the completion of a repeatable quest in Blade’s Edge Mountains. Sounds easy, doesn’t it? Except you can’t pick up the quest until you’re revered with the Consortium. So, uh, have fun with that! And I just realized that she’s wearing the wrong boots in this screen capture. And that the boots aren’t in my bank anymore. Oops. This look is a hybrid of three sets: Reinforced Sapphirium Battlearmor (Lookalike), Glorious Plate (Recolor) and Battleplate of Radiant Glory (Lookalike). Cathedral is my clothes horse, so far as my small army of alts is considered. Here’s what she’s wearing at the moment. The farther we get from Cataclysm, Pauldrons of Edward the Odd are going to become harder and harder to find. If they aren’t currently available on your Auction House, the clone Burden of Morality drops from Chimaeron in Blackwing Descent. Meanwhile, Paladins with a Mantle of the Forlorn Conqueror token can purchase Reinforced Sapphirium Mantle from the Legacy Justice Quartermaster. For a slightly different look, consider the Blinding Girdle of Truth (purchased from the Valor Quartermaster for 1,650 JP) instead.